Plexidor Pet Doors: Is it possible to install a PlexiDor through a wall? Is it possible to install a PlexiDor through a wall? When installing a pet door, it's easy and logical to put it through the house door. The PlexiDor is available as a door kit making it easy to install through a standard door, a somewhat handy person can do it, and it doesn't take long. However, installing through a door isn't always practical. 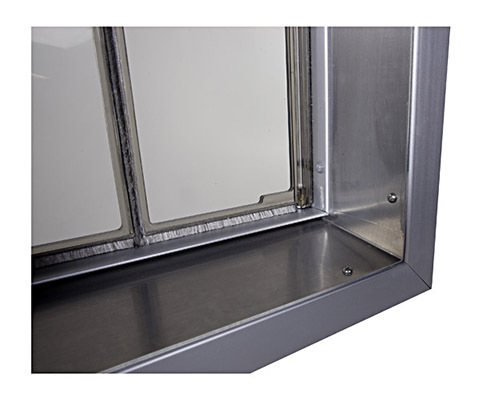 The PlexiDor cat door and dog doors are available as a wall kit and can be installed in cement, stud, brick, or block walls up to 12 inches thick. The kit comes with an aluminum tunnel that connects the interior and exterior frame. The image shows a PlexiDor with the aluminum tunnel. The tunnel has a gentle slope to keep water away from the house, and it gives a professional finish. Installing through a wall can be trickier than installing through a door – it is more difficult to make a hole in the wall than through a door. (An important tip is cutting from the outside – keep the mess outside the house!) You also need to check if it’s a load-bearing wall or not. The video below shows how to install a PlexiDor through a door and through different forms of walls. It begins with installing through a door. Wall installations start around 9 minutes in and will go through the installation process through different wall materials. How do I stop my cat from scratching up my sofa? Wrinkly dogs may need some extra care. Does your cat ignore you?